Driver is from Intl-outdoor.com, but he does not sell it anymore. 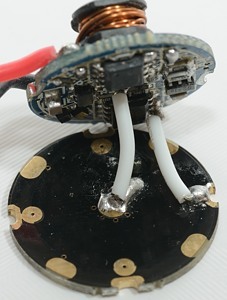 Height: 9.5mm, 15mm with the contact board. 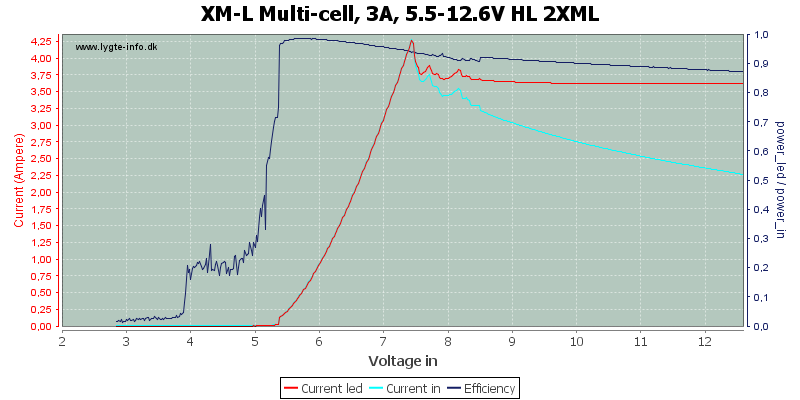 Tested with: 1, 2 and 3 Cree XM-L2 in series. 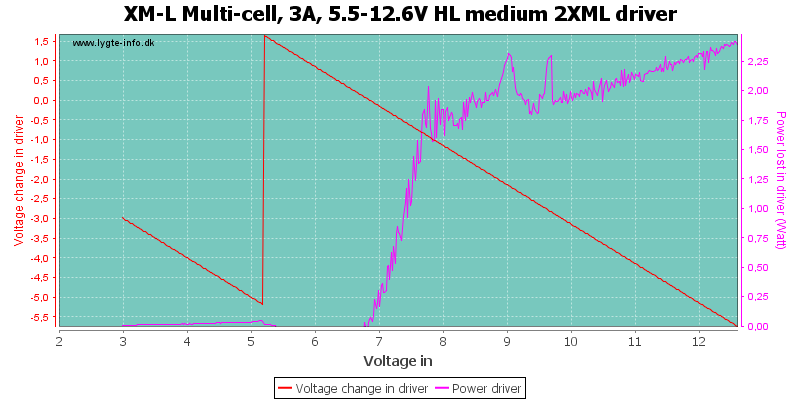 The driver has high, medium and low. A fast off/on will select next mode. 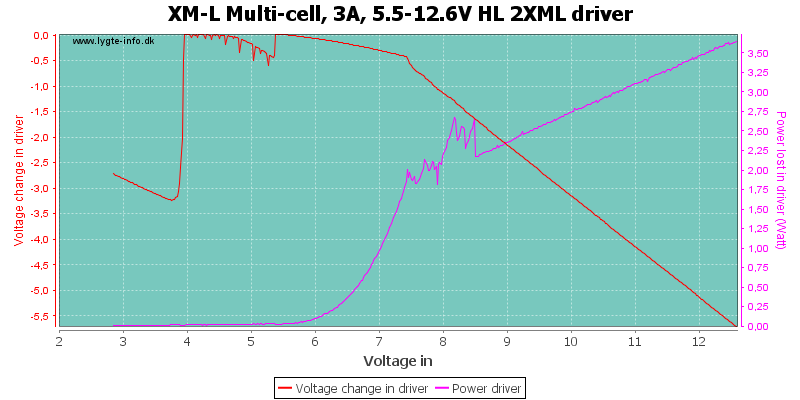 The driver has very good stabilization down to 5.5 volt, where it warns about low battery. This warning is only useable for two cells. The efficiency is not that great with 3 cells, but gets better with two cells. 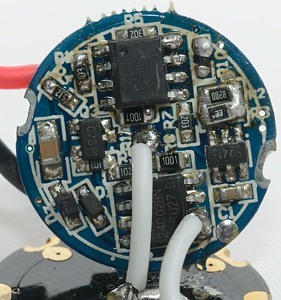 Up to 4 watt is lost in the driver. 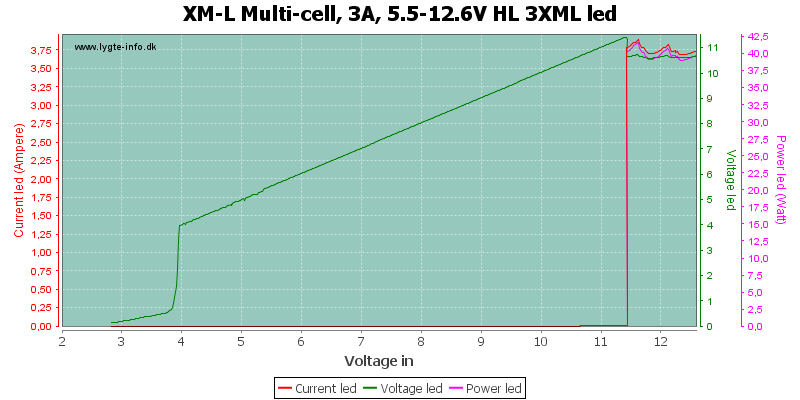 The led as supplied with 13 watt and 3.6 ampere. This current is to high for the led and can be a problem. Running the test in reverse, i.e. 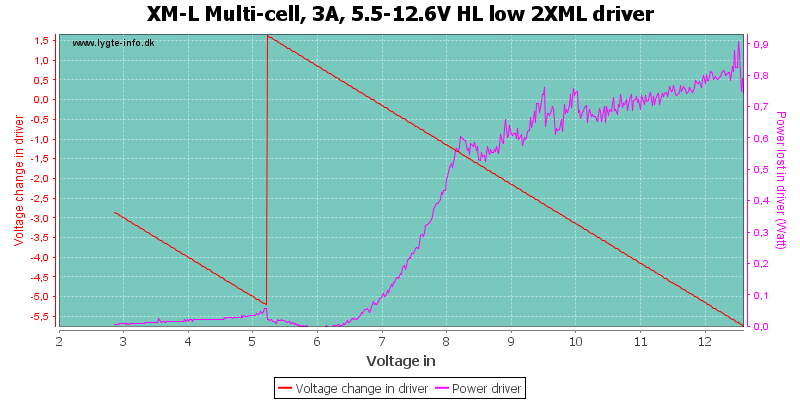 slowly turning up the voltage, shows that the driver starts at about 4.8 volt. 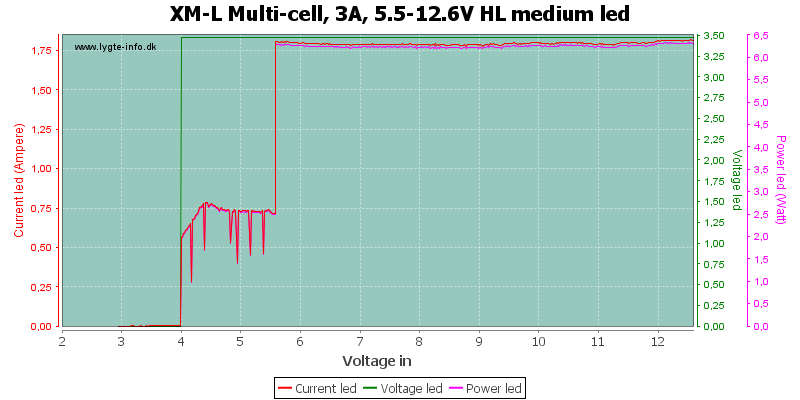 The current to the led is very smooth, only a small amount of the buck converters frequency can be seen. 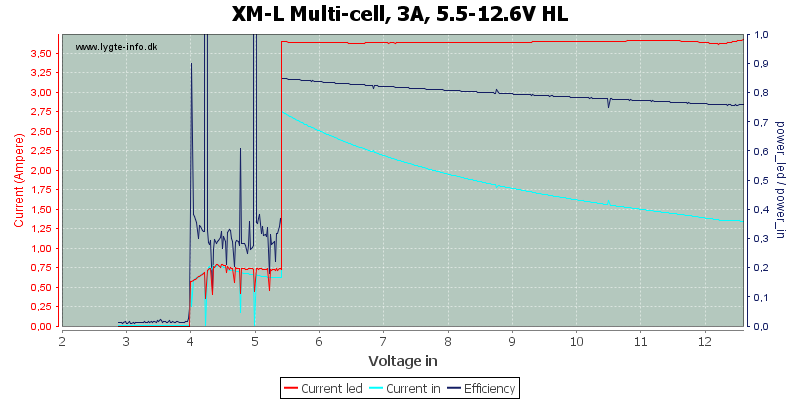 Low voltage warning is two flashes, but it is only useable for two cells. Medium is about half the current of high, in my opinion it is a very high medium level. 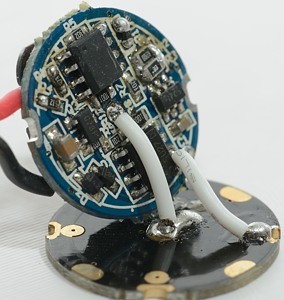 I do not measure the led voltage, but assumes it is the same as in high, this is necessary to do the power and efficiency calculations. The led has about 6.3 watt in medium. 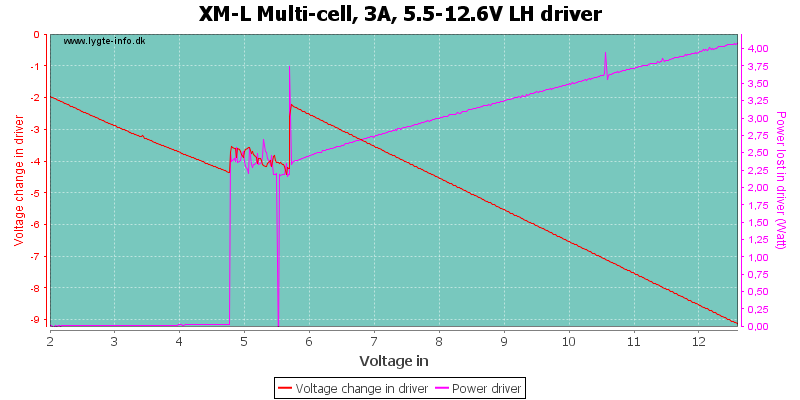 The driver uses pwm to set medium level and the duty cycle is 48%, this matches the 50% current very well. 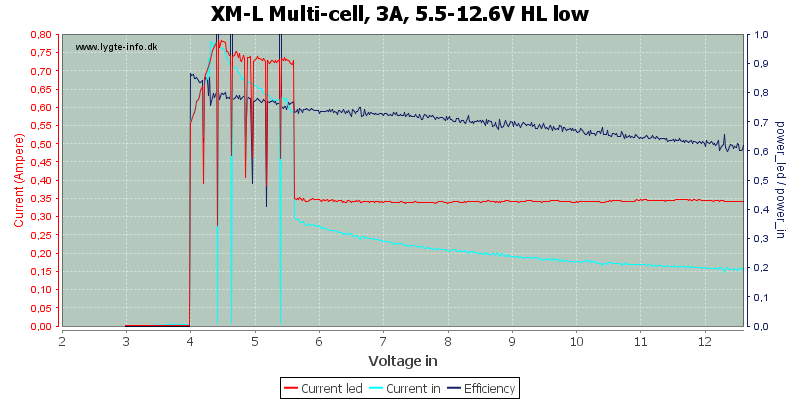 In low the current is 0.35A. 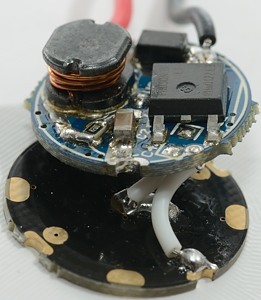 The power to the led is about 1.2 watt. The driver uses pwm to set low level and the duty cycle is 9%, this matches the 10% current very well. 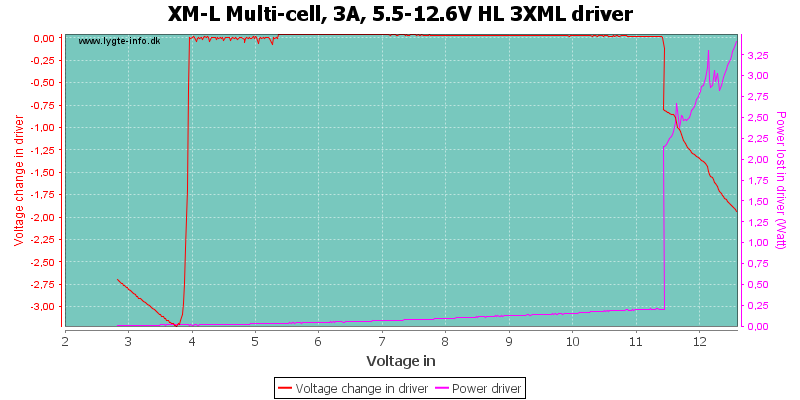 This driver can also drive two leds in series. 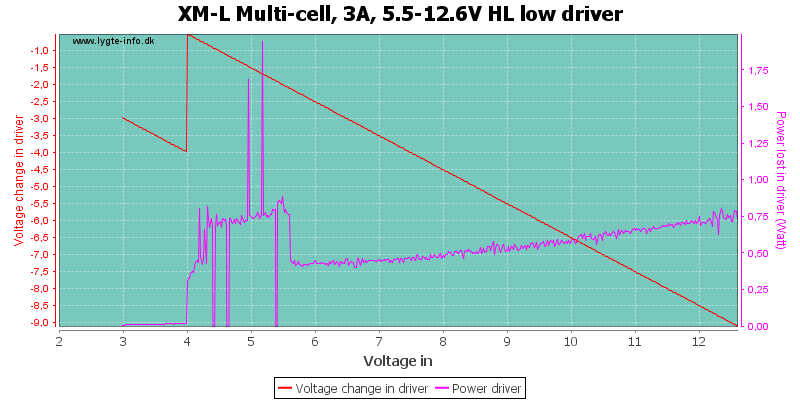 With two leds in series, the driver does some funny stuff, just before it goes out of regulation. 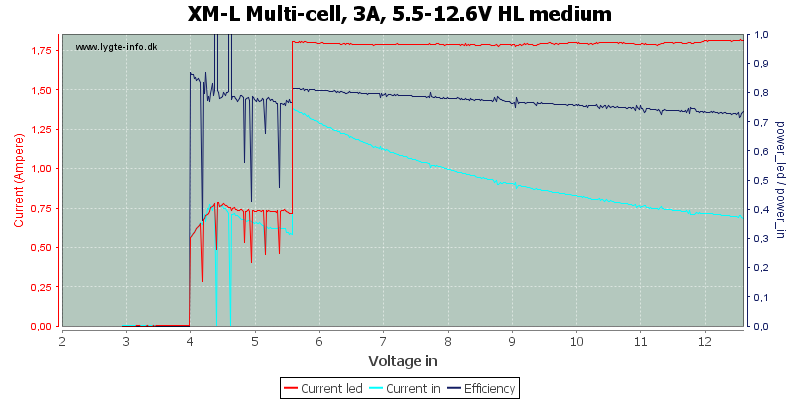 As can be seen on the curve I measured a peak current of 4.25A. 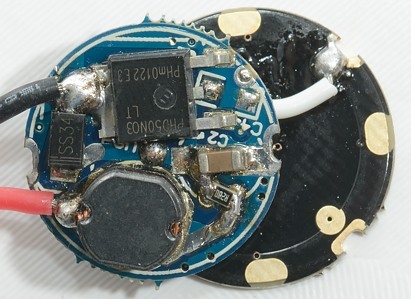 The loss in the driver goes down with two leds. 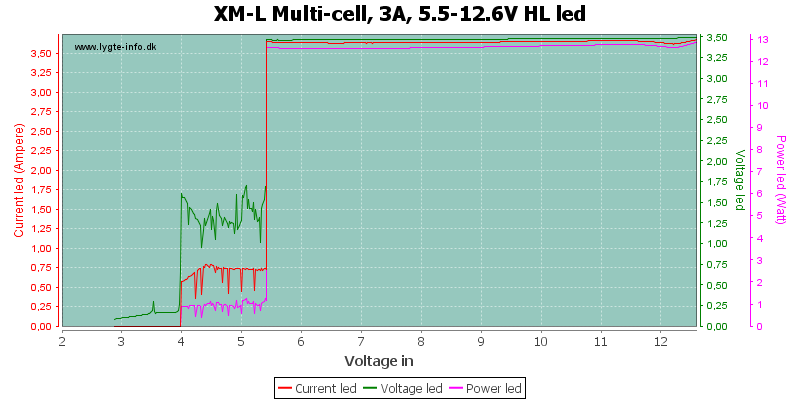 And power to the leds is double up, i.e. 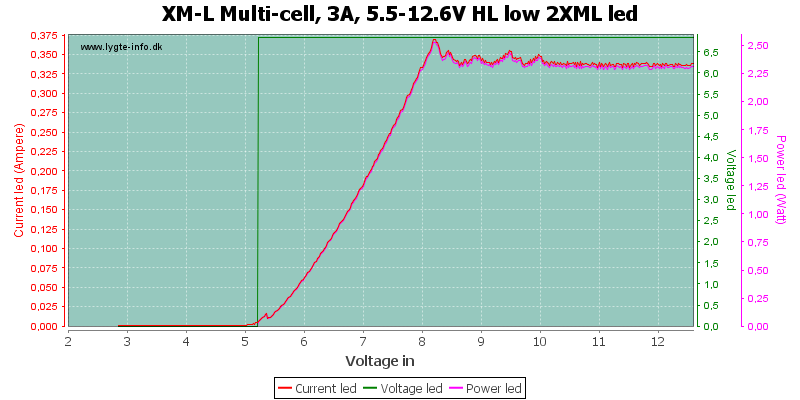 25 watt. 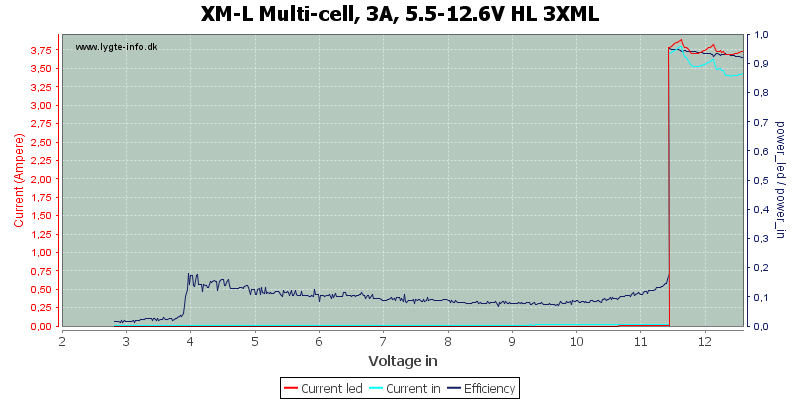 In medium the current peak can also be seen. The over 100% efficiency is, of course, not correct. 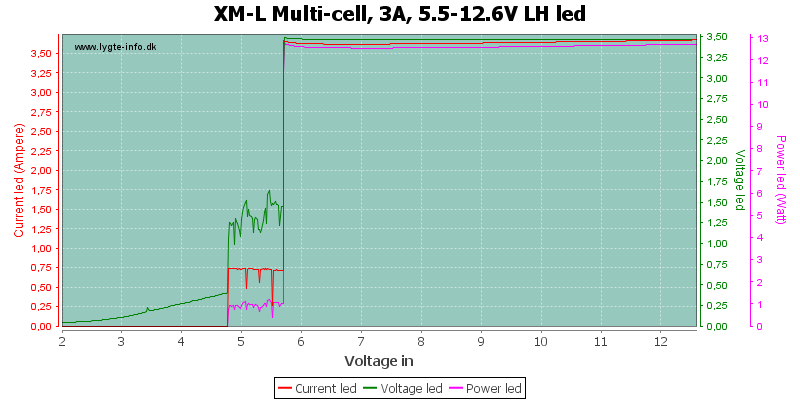 This is because the fixed led voltage is wrong, when the input voltage gets below about 7.5 volt. The medium mode is about 12 watt with two leds. 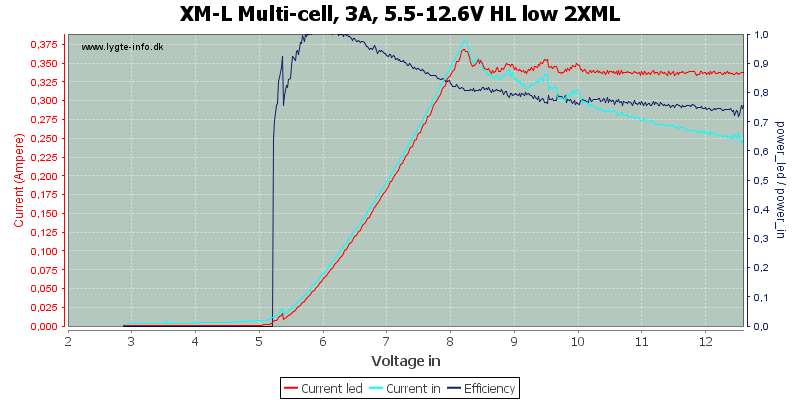 The current spike is also present in low mode. 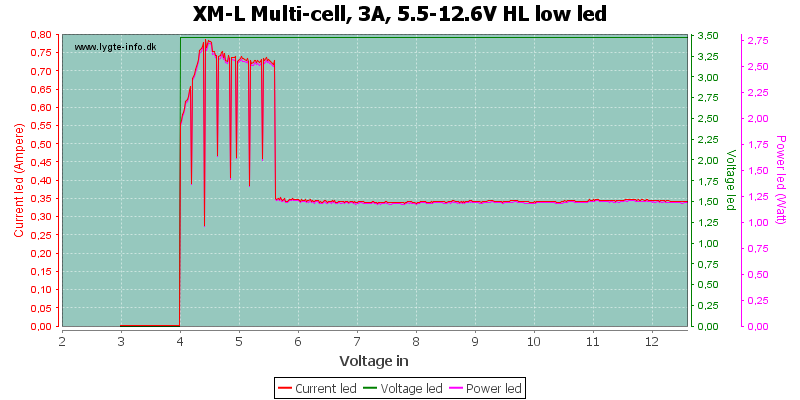 The led power is about 2.3 watt. This test did not work as expected. 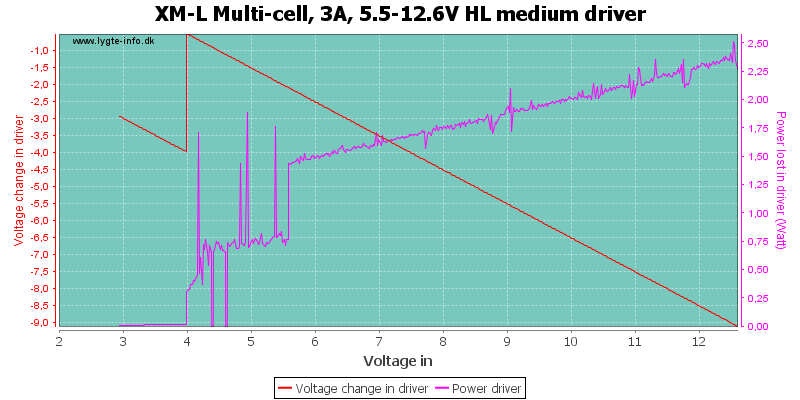 The driver delivers a bit more current than the leds is rated for and either that or an even higher spike killed one of the leds. 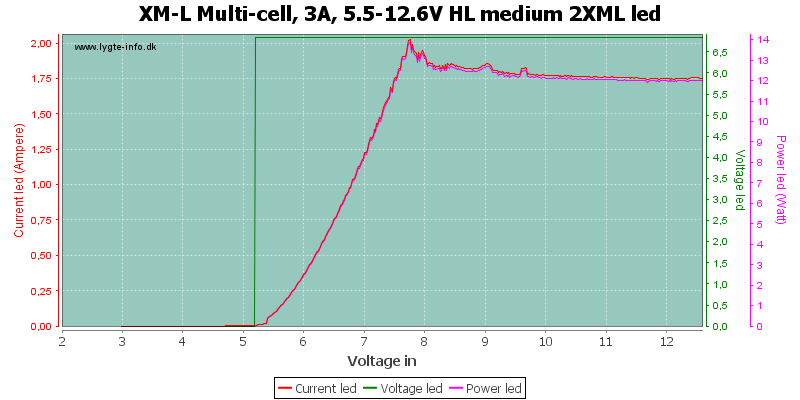 The led is rated for 3A, but the actual current was between 3.75A and 3.9A. 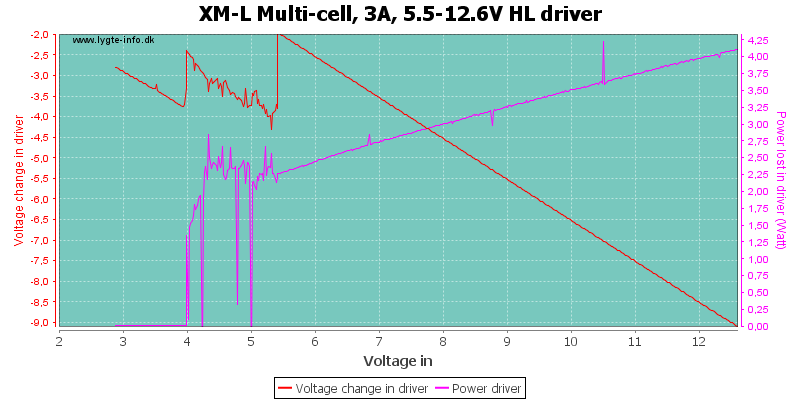 The driver has good stabilization for one led, but does supply to much current. 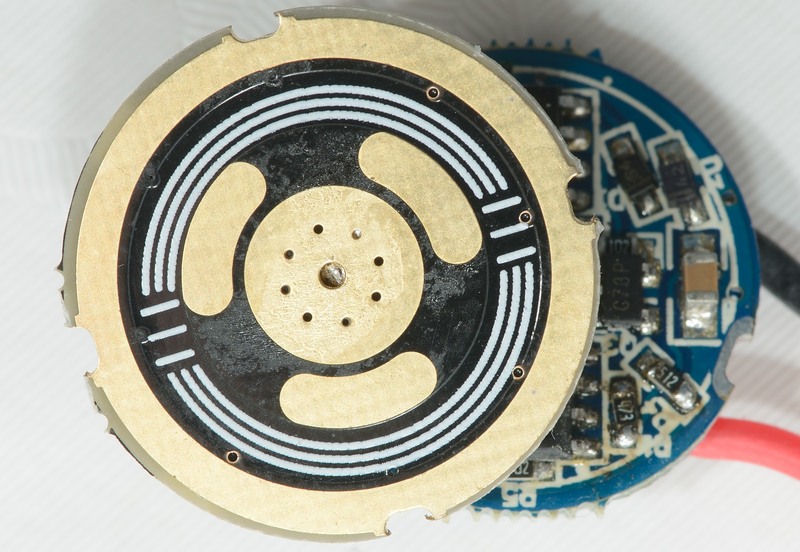 The low battery warning can only be used for two batteries. 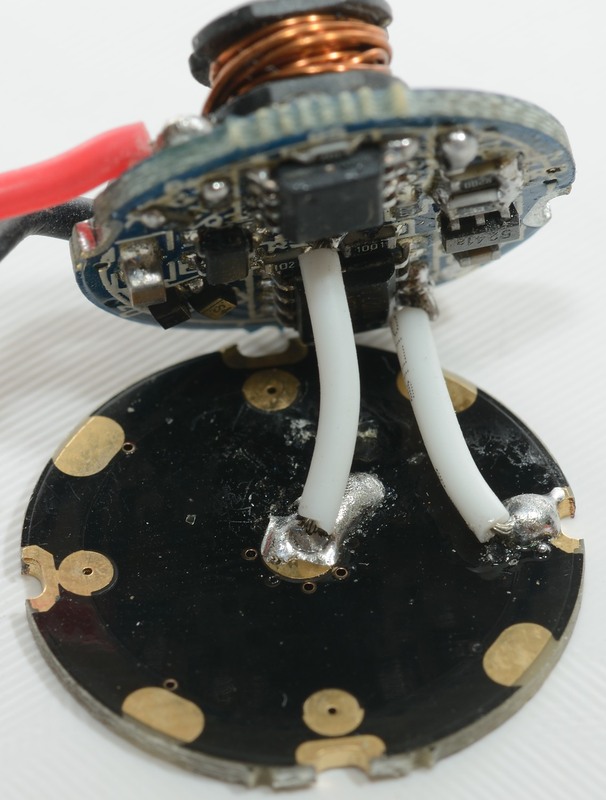 Using it with 2 or 3 leds, does increase the risk of blowing the leds, due to the current spike just before going out of regulation.